There’s no way to understate the importance of an organized and fully-functioning warehouse for your business. It doesn’t matter what your company does, whether it’s e-commerce, manufacturing, or storage services. If you have a warehouse, it needs to be organized and efficient. Think about it, do you think companies like Ebay or Amazon were able to become as big and prominent as they are without first having a system that works? The secret is all in the basics when it comes to organization and efficiency. If you don’t have a simple way of keeping things in order that makes it easy for employees to know where things are located, you’ll never be able to progress beyond that. 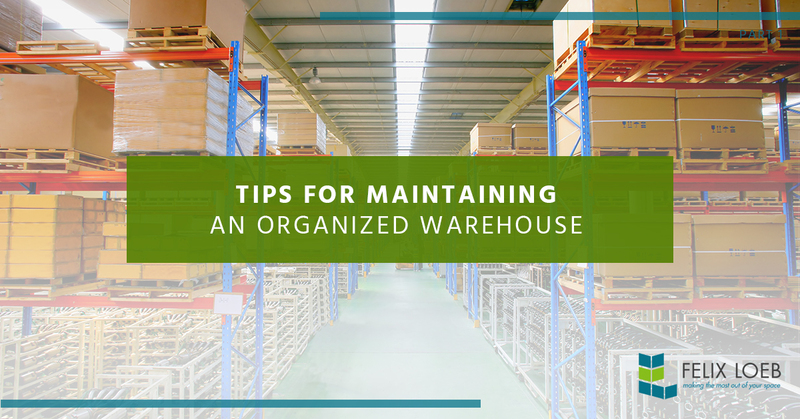 In this blog, we’re going to discuss some fundamental tips to keep your warehouse organized. Before you do anything else in your warehouse, you need to consider the 5S rule. So what exactly is this rule? This consists of five different tasks, sorting, setting in order, standardizing, shining, and sustaining. This comes from a 16th century Japanese strategy for maintaining organization in your place of work. Implementing the 5S strategy will help you be effective, efficient, and safe while working, all of which will benefit your company as a whole. Let’s take a look at each one of these. Sorting involves going through your entire inventory to see what actually benefits your company and what does not. This is an important step especially if you have limited warehouse space and need to be smart about how much you keep in it. Shining refers to cleaning up your work environment. Yes, what your parents taught you when you were a young child still applies to your life today! Having a clean work environment will help you maintain your safety standards as well as stay more organized. Setting in order means coming up with a way to make everything easy to find and easily accessible. This is not always easy but can be made much easier with modern product like pallet racking, steel shelving, and fork lifts to transport heavy items. But what may work for one company may not work for another, so it’s important to find what works for you and stick with it. Once the system has been established, you can make adjustments as it’s necessary. Standardizing has to do with making your new organization technique standard across your whole company. Whether that means opening a new warehouse and implementing the same techniques or simply passing them on to new employees. You want everything to work together in harmony so there aren’t any hiccups in the process. Sustaining is the final part of the 5S strategy. Sustaining essentially means that you’re going to retain all the hard work you’ve put into this new organizational system and not fall back on it once you go back to your normal daily routine. It helps to keep everything documented in order to keep the system in place. Pallet racking is one of the most effective ways to organize a warehouse. Companies like Sam’s Club or Costco depend on pallet racking and so should you! These are just a few of the reasons pallet racking is so beneficial for small and large businesses alike. They reduce warehouse expenses by the thousands each year by ensuring that you can fit more in your warehouse without expanding or purchasing other warehouse materials that are not needed. You’ll have more room to move around since your inventory will be stacked vertically rather than horizontally. This will allow you to get machinery inside the warehouse that you wouldn’t be able to otherwise. Pallet racking systems can be designed to fit your needs and your wants as a business owner. Pallet racking is becoming a far more affordable option for business owners across America. Your warehouse will be far safer and you can sleep soundly knowing that your inventory isn’t scattered across the floor. Are you ready to start organizing your messy warehouse? Felix Loeb has everything you need to start from pallet racking to wire shelving and beyond. Contact us today for a free consultation.